Dynamic DNS service is used to keep a domain name pointing to the same computer or server connected to the Internet despite the fact that the address (IP address) of the computer keeps changing. This service is useful to anyone who wants to operate a server (web server, mail server, ftp server, irc server etc) connected to the Internet with a dynamic IP or for someone who wants to connect to an office computer or server from a remote location with software such as pcAnywhere. NOTE: Our Domain Plus currently does NOT come with Dynamic DNS. For more information on how to upgrade your service level to use this feature, please go HERE. NOTE: Dynamic tokens must be entered in place of your account password, as many updaters only use clear text. We only allow the use of the token to avoid exposing your password. NOTE: You may be warned that an A record already exists for the host you are making dynamic. 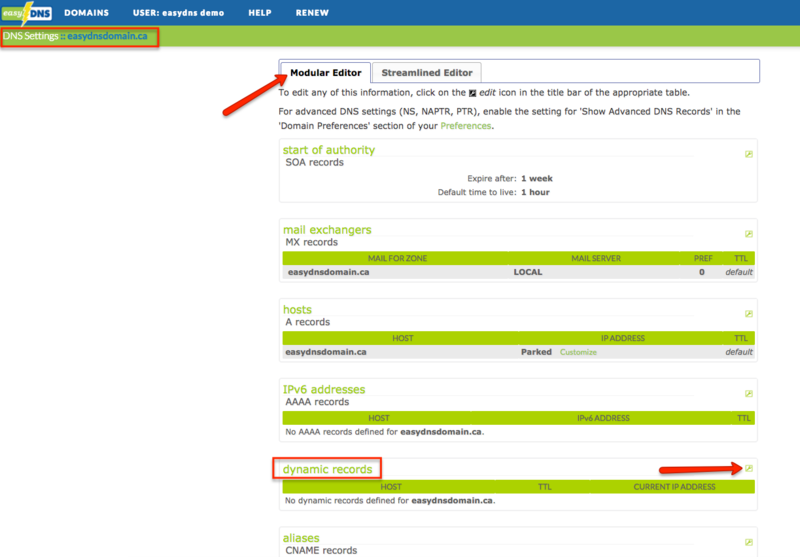 If you are sure you wish to make the record dynamic and stop resolving it to whatever it was before (an existing page or a parked page), simply ignore the warning and confirm the changes. Many routers have an option to enable dynamic updates. This can be very convenient, as the router is always the first place the IP address change makes itself known. Some of these include easyDNS as one of their options, and you need only select it from the menu they provide. Others allow you to enter the settings for your dynamic server. If your router does not include easyDNS or allow you to enter your own parameters, you will want to use a software-based updater. For Linux, Sourceforge provides an excellent update client for Linux called ddclient. One of our clients has written a nice java-based client that runs on Linux and can be downloaded from their project site HERE. There’s a very nice piece of software called Dynsite, which continues to be maintained by its creator Noel Danjou. You can download it HERE. For a walkthrough on installing and configuring it, please see the Dynsite tutorial HERE. The following is what you need to know to code a Dynamic DNS client for use with easyDNS. Giving credit where credit is due, the protocol used below was adapted from the format used at dyndns.org. After evaluating various approaches out there, we felt theirs was the simplest and most straightforward. However, there are some differences such as the back _mx parameter which has a different meaning to our system. If you do not include the myip parameter, our update script will look to the IP the request originates from and update to that. If you do code a client for easyDNS, please email our support team so we can keep you informed of any changes, enhancements, bug fixes etc. Also, please be sure to let us know about your client, which platform it runs on, and where our users can download it so we can add it to our dynamic page. The full hostname being updated. The root domain of your hostname. For example, if your hostname is “example.co.uk” you should set “tld” to “co.uk”. This field can be omitted in cases of second level domains like example.com. The IP address of the client to be updated. Send “0.0.0.0” to set record to an offline state (sets record to “offline.easydns.com”). If you are behind a firewall or NAT set this to 1.1.1.1 and our system will detect your remote IP for you. Use this parameter as the MX handler for the domain being updated. It defaults to preference 5. Either “YES” or “NO”. If “YES” we set smtp.easydns.com to be a backup mail spool for domain being updated at preference 100. Either “ON” or “OFF”. If “ON” sets a wildcard host record for the domain being updated equal to the IP address specified in “myip”. The authentication failed. This no only happens if the username/password are wrong, but if they send a hostname for a domain that isn’t under the user’s account. Dynamic DNS is not turned on for this domain. 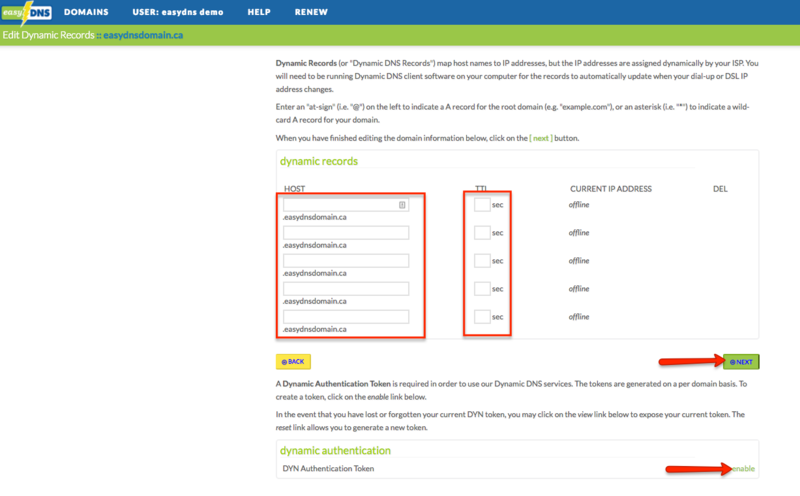 Each domain must have it’s own dyndns flag enabled individually (by the user) in their member settings. Self-explanatory. Client sent data that is outside the allowed set for a dyndns update. Not enough time has elapsed since the last update. You need to wait at least 10 minutes between updates.